There is a lot at stake and thus, the people who have a lot to lose are nervous. Often when powerful people worry about protests, they ask the police to come in and break up the riff-raff. 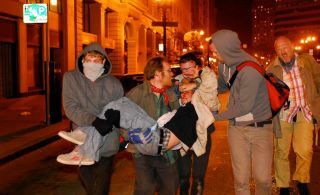 The consistently peaceful protest in Oakland was brutally broken up by the Oakland police yesterday. Last night these Oakland cops critically injured an Iraq vet named Scott Olsen with a tear gas canister. He may not make it. Today thousands of people called in angry at the police’s unnecessary violence. There is a movement to recall the major. It turns out it wasn’t a rubber bullet. It was a tear gas canister fired at point blank range that struck him in the head. 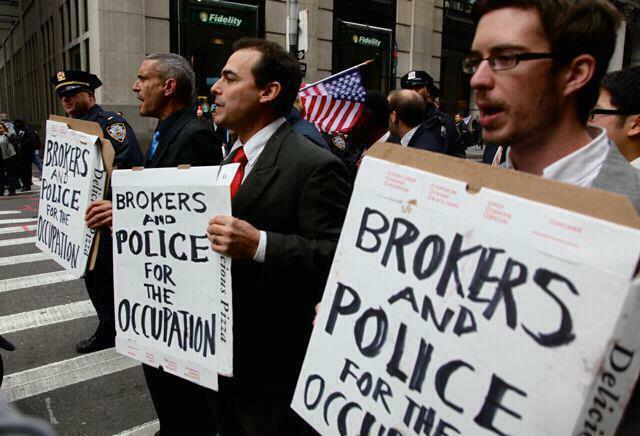 The ‘cops’ and ‘brokers’ demonstrating in favor of OWS is actually the YES MEN. You can most easily recognize the broker to the right of the cop. BTW I’m familiar with the mistaken notion that the broker who spoke very honestly about Wall St a few weeks ago was a Yes Man. He wasn’t. He was just an inadvertently really unabashed and therefore honest broker. But this is definitely the Yes Men. lol. Teach me to repost FB pictures (tho i do it all the time). Thx Brian for keeping it real (and precise).